There’s nothing better than a good love story like that shared by legendary designer Carmen Marc Valvo and brand President Christian Knaust, who first met when both were students at Parson’s. Now married, the couple celebrated their 25th anniversary together back in 2014 with a swanky soiree in the Hamptons. 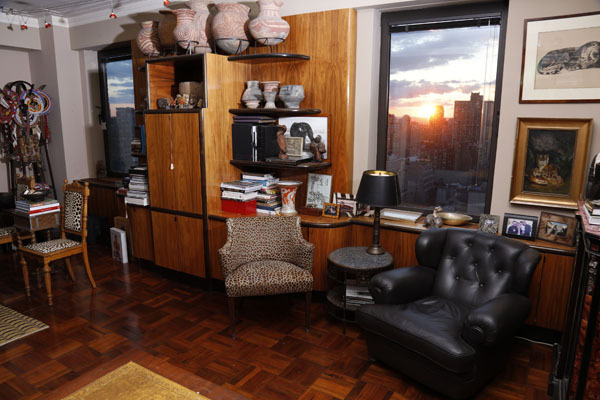 A 200 year old villa near the Bosnian sea in Sweden, bequeathed by Christian’s family, a 40-acre residence in Costa Rica, an apartment at the iconic Majestic on Central Park West -converted from two apartments, the dwelling encompasses an entire floor, and is a sculpture filled oasis with stunning views. 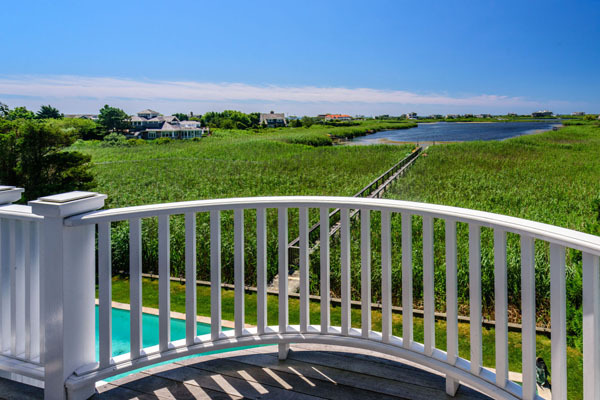 The oceanfront Bridgehampton estate which also abuts the Mecox bay has been owned by the couple since 1988, and is a haven where the early risers love to kayak, swim and play in their garden. C&C: Every part of the house is beautiful, we sit on the terrace outside of the pool house, which is elevated, and we have our lunches there usually, and it’s the same view that we fell in love with when we first saw the house. Every part of this house has a very unique quality. We love it. Because we are so close to the water, we couldn’t change the footprints, we were allowed to extend the kitchen, ever so slightly. It still has the same bones and ceiling as an old salt box, but with a few gables added and a few columns, a larger porch. 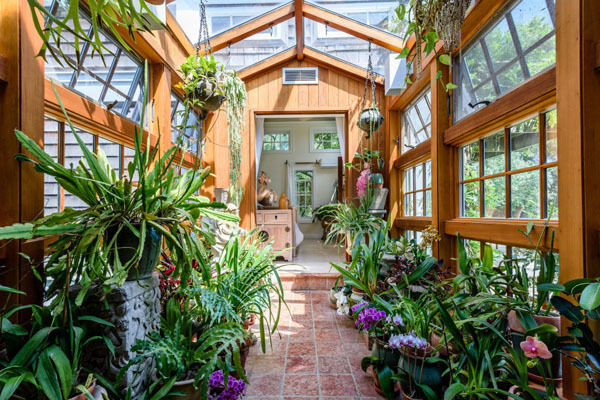 It’s like a tiny jewel box – that’s what we call it – the greenhouse, the shade garden, the deck, the pool, the bay – it’s very, very magical. Chris and Carmen regularly entertain at the home, hosting some charity events, but mostly family and close friends. As in all of the couple’s residences, the Bridgehampton home’s central hub is the kitchen, where guests are warmly welcomed and experience the culinary creations of the self described “chef and sous chef”. 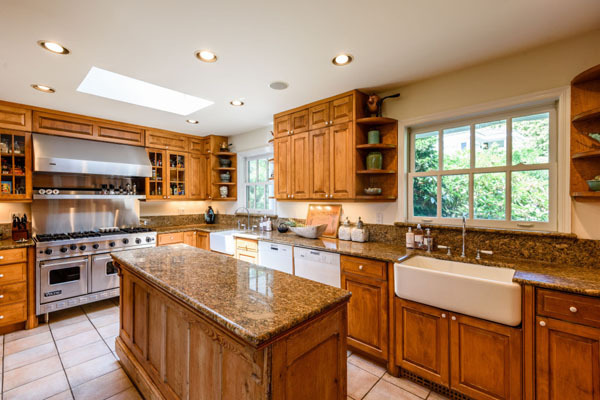 C&C: The chef’s kitchen is amazing, it’s very easy to cook in there, and it’s very well planned. We had the kitchen re-done and we ended up with 2 of everything basically, 2 freezers, 2 dishwashers, 2 sinks, 3 refrigerators, 4 ovens and 6 burners on a Viking stove, and a grill that you can basically put a whole pig in, if you wanted to. It’s huge. We have 25 family members for 5 days for 4th of July every year, and we have to be able to cook and make sure we have enough space for everything. Carmen’s collections have become some of the most sought after among fashionistas of all shapes and sizes, and his designs have graced the frame of numerous celebs including Beyonce. But, Mr. Marc Valvo has his eye on adding actress Kate Blanchett to that list. 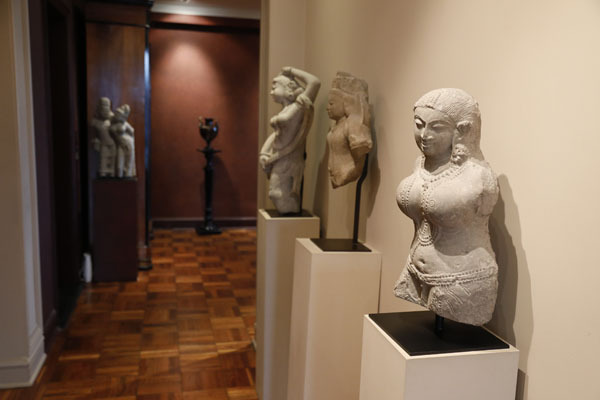 The home recently served as the setting of a video shoot in preparation for the Carmen Marc Valvo New York Fashion Week runway show, which is always a coveted ticket. The beauty of the landscape provided inspiration for the line, which Carmen described as “kind of like barefoot on the beach, it’s very laid back and carefree- a sophisticated, dressed down elegance”. Prime examples of the adage “to whom much is given…”, Chris and Carmen espouse the tenet of giving back. Having survived colon cancer, Carmen is particularly committed to increasing awareness about the issue, but supports many philanthropic causes. CMV: The fashion industry to start off with, has always been very involved with women’s health issues, especially breast cancer, because it’s something that touches our customers so nearly and dearly, and it’s something that we see, and so as a fashion designer, doing exclusive collections to raise money for breast cancer research has always been important to me – my dad was doctor, my mom was a nurse. I came out of the “cancer closet” through the help of Katie Couric. That was really hard for me, because I wasn’t expecting to share the story, but it was probably one of the most uplifting things I’ve ever done. It’s not breast cancer, it’s not colon cancer, it’s health in general. If we do research or funding for one, we may ultimately find the cure for another. Anything we can do to raise funds and awareness is beneficial to all humanity, and so it has really become one of my life’s goals. Education and conversation will ultimately allow us to win the battle. 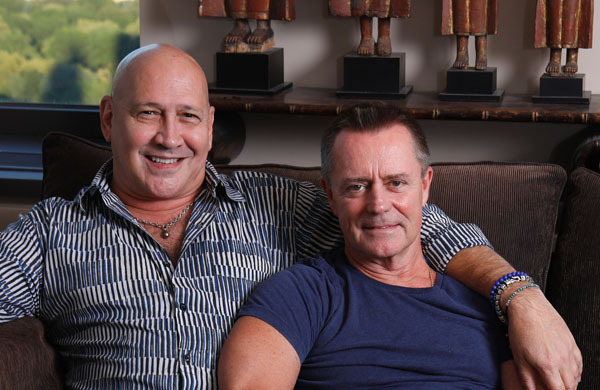 Travel aficionados, Chris Knaust and Carmen Marc Valvo have journeyed the world – Africa, Bora Bora, the Maldives – but always prefer to shelter at home, whether it be in Central America, Europe or New York. Their beautiful Bridgehampton home is a testament to their mutual love, respect and admiration for quality, craftsmanship, exquisite design, and above all, each other.